Australia is the sixth largest country on the map and is sometimes described as the Earth’s largest island or the world’s smallest continent. Also referred to as The Land Down Under, Australia is located in the Southern Hemisphere below Indonesia and northwest of New Zealand. Australia is bordered by the Pacific Ocean to the east, the Indian Ocean to the west and the Southern Ocean to the south. 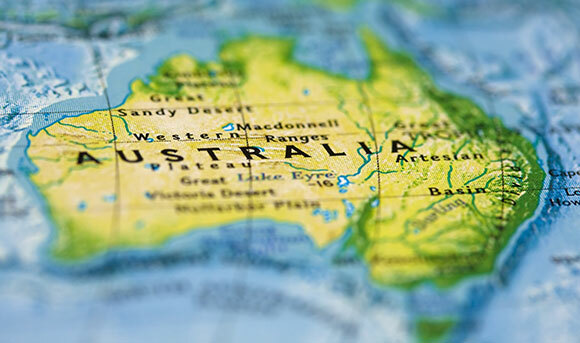 The country is divided into six States (Victoria, New South Wales, Queensland, South Australia, Western Australia, and Tasmania) and two Territories (Australian Capital Territory and Northern Territory). This vast island nation is known for its diversity of animal and plant species (many of which are only found in Australia) and boasts over 10,000 beautiful beaches, as well as tropical rainforests, rugged deserts, scenic mountains, grassy hills, roaring rivers and mighty waterfalls. Famous Australian natural landmarks include the Great Barrier Reef, found off of the northeastern coast of the country, and the magnificent, massive monolith known as Uluru (or Ayers Rock) located in the “Red Center” of Australia in Northern Territory.